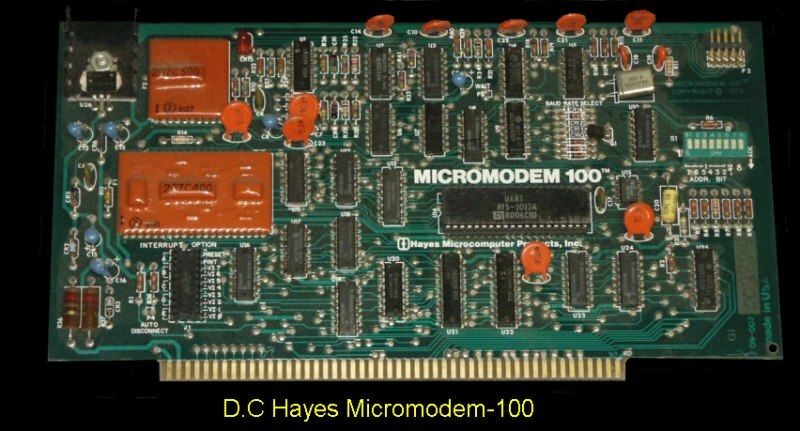 This was Hayes second S-100 modem board. It ran at speeds from 45 up to 300 Baud. The MICROMODEM 100 was a complete data communications system for S-100 microcomputers combining on a single board functions which formerly required a modem, an automatic calling unit and serial and parallel interfaces. The result was a sophisticated computer-to-computer or terminal-to-computer modem for use in small computer systems. The MICROMODEM 100 provided all the capabilities of a serial interface card and an acoustic coupler, with the addition of programmable automatic dialing and answer. The MICROMODEM 100 came with its own MICRO-COUPLER™ unit. This was at the time an exclusive new device that allowed you to connect your S-100 computer directly into any modular jack provided by your local telephone company without the need of a DAA from the Bel system as was the case with the 80-103A board. Fully S-100 bus compatible including 16-bit machines and 4 MHz processors. Two software selectable baud rates — 300 baud and a jumper selectable speed from 45 to 300 baud. (110 was standard). Supported originate and answer modes. Direct-connect Microcoupler. This FCC-registered device provided direct access into the local telephone system, with none of the tosses or distortions associated with acoustic couplers and without a telephone company supplied data access arrangement (DAA). Auto-Answer/Auto-Call. The MICROMODEM 100 could automatically answer the phone and receive input; it could also dial a number automatically. Software compatible with the D.C. Hayes Associates 80-103A Data Communications Adapter. The brochure for this board may be obtained here. Over the "modem years" the Hayes modem command set enlarged and evolved. It was incorporated into modem LSI chips like those of Rockwell and was essentially the standard for any computer controlling its modem interface. A listing of this "AT" command set can be obtained here.